Long-term financing and its focus on small monthly payments can be troublesome for many consumers and dealers, cautioned a recent Financial Consumer Agency of Canada (FCAC) report. This wasn’t news to car dealers. Long-term financing has been rising steadily in Canada since 2010. The problems it can create -- including negative equity trade-ins when consumers want or need to change vehicles before they build any equity in those 72-, 84- or 96-month loans -- have to be confronted in some manner every business day at dealerships across the country. Roughly 30 per cent of all trade-ins now have some negative equity. Typically, it gets rolled into another long-term loan, and no surprise how that story plays out: deals get harder to make, and when they do come together, consumers wind up taking on more debt. When it comes to negative equity, nobody’s a fan. 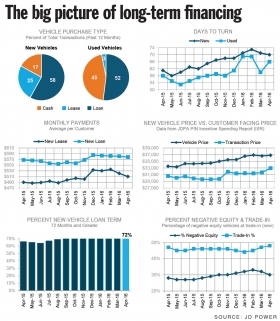 But outside of more leasing, the only ways to turn around the negative equity ship appear to be small adjustments in dealer processes, and more consumer awareness. Dealers have to be mindful of who they offer these long-term loans to, says Paul Goodman, a sales manager at Nurse Chevrolet Cadillac, in Whitby, Ont. He notes young people aren’t particularly good candidates for such loans, as their social and work circumstances will be the most volatile over the ensuing five to 10 years. Also, anyone in an already precarious financial situation will not likely be able to cover the shortfall if they need to get out of the loan early, and/or pay repairs and maintenance on top of loan payments later in the term. Those who drive more than average, or don’t maintain their vehicles particularly well, or are the type yearning for the latest and greatest automotive technologies, are also potentially not great candidates for long-term financing. Raymond O’Kane, managing director and head of national dealership finance for the Bank of Montreal, has advocated numerous times for shorter-term finance deals for some customers, noting that many clients in long-term loans have the financial capacity to be in 48- or 60-month terms instead. After you’ve made the sale at 72, 84 or 96 months, dealers have nothing to lose, he contends, by offering the customers one final chance to shorten the term, so they save interest and build equity faster. “My hope is that consumers will consider the impacts of the extended car loans before they go into them,” said FCAC commissioner Lucie Tedesco, in an interview. The agency’s mandate is to identify issues that impact consumers, via the institutions that the agency regulates. After the 2008 financial crisis, federally-rated financial institutions acquired a more prominent share of Canada’s growing auto finance market. “So we naturally wanted to better understand that market, and particularly the risks associated with long-term car loans for consumers,” said Tedesco. Consequently, the FCAC released its report, Auto Finance: Market Trends. The report noted that the initial amount of negative equity rolled over by consumers is typically disclosed in the dealer’s bill of sale and the conditional sales contract, but their exposure to negative equity over the life of their auto loan is not disclosed on any subsequent documentation they receive. “Even though they (banks) go through third parties. we expect them to meet the disclosure requirements,” said Tedesco. Of course, if customers keep their vehicles for the entire loan term, negative equity never becomes a factor. And customers can stay in their vehicles for eight years and longer, because vehicles now last at least that long. “Some customers choose to finance a vehicle over its useful life … which makes sense to me,” says Steven Chipman, CEO of Winnipeg-based Birchwood Automotive Group. CADA’s Hatch also points to the low default rate among auto loans in general, suggesting that most Canadians don’t get caught out by long-term loans. But the FCAC points to a sudden uptick in defaults among long-term loan holders, particularly in Western Canada, which is in the throes of an economic downturn.